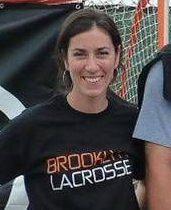 Jessica (Lerman) O'Brien, a co-founder of Brooklyn Crescents Lacrosse Club, has been playing lacrosse for 20 years and coaching for eight. She is a US Lacrosse Certified Level 1 coach. Originally from Penn Yan, NY, where she won a NY State high school lacrosse championship, Jessica played four years of Division 3 lacrosse at the University of Rochester, earning Regional All-American honors as an attack player. Jessica lives in Clinton Hill with her husband and son Bo and works for the NYC Department of Education's Office of District Planning.